The probe agency had seized the hard disc of a computer, a mobile phone and some other gadgets from the residence of the teenager to figure out his thought process. 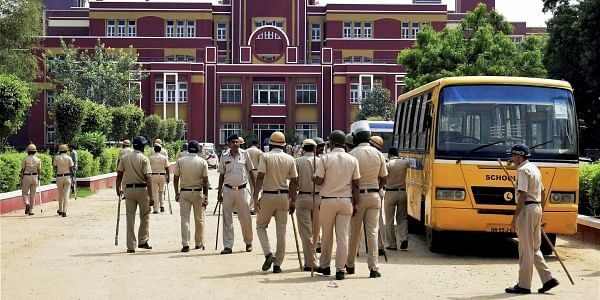 NEW DELHI: The CBI was going through the internet surfing records of a Class 11 student, who was apprehended in connection with the killing of a junior in Gurgaon's Ryan International School, in a bid to figure out his thought process, sources said. The probe agency had seized the hard disc of a computer, a mobile phone and some other gadgets from the residence of the teenager, the contents of which were being analysed to understand his internet surfing habits, they added. The exercise was aimed at finding out what could have led a 16-year-old boy, a piano student, to allegedly take the drastic step of killing a Class 2 student to get the school to defer a parent-teacher meeting and an exam, the sources said. The agency had searched the boy's residence on September 28, but kept it under the wraps to prevent any speculation about him emerging as a prime suspect in the case, they added. "They have seized a hard disc, a mobile phone and some other gadgets. They did not drop any hint that they were probing his role," the father of the teenager told PTI. He alleged that his son was being framed by the CBI. If the blame was pinned on a student, he added, the school management would not be liable to pay damages, but it would have to do so if a staff member was convicted. "The CBI does not have any answer about the whereabouts of (school bus conductor) Ashok Kumar. Where was he for those nine minutes?" he asked. He also accused the CBI of torturing his son to extract his confession. "I was not allowed to enter the room when he was questioned at the CBI headquarters. I was asked to wait outside. He is a 16-year-old student who was helping the agencies to find out the truth and now, he is an accused. The CBI has made its own story and is now putting the corroborative pieces together to fit into it," he said. The central probe agency, however, denied the charge. The teenager was reportedly under the CBI scanner after the agency enhanced a grainy CCTV footage obtained from the school, which showed the victim, Pradhuman, going into a washroom, the sources said.They, however, remained tight-lipped on whether the teenager accused was spotted in the footage, luring Pradhuman into the washroom. The accused was quizzed by the agency several times before being apprehended on November 8, the sources said. The agency had also thoroughly probed the involvement of Kumar, the school bus conductor, who was arrested by the Gurgaon police on the charges of killing Pradhuman, but could not find any evidence indicating his involvement, they added. The sources refused to comment on the possibility of Kumar being framed by the police and the complicity of Gurgaon police officers in destroying evidence in order to help the teen accused escape the clutches of law. "We can neither confirm nor deny the developments reported in the media," CBI spokesperson Abhishek Dayal said, when asked whether the agency was probing Gurgaon police officers for slapping charges against Kumar in the case. The CBI would file its chargesheet "well within" three months of the teenager being apprehended, he added. On the morning of September 8, Pradhuman was found dead in a toilet of the school with his throat slit, within an hour of his father leaving him at the school. In a twist in the case, the CBI recently announced that it had apprehended a senior student of the school in connection with the incident, rejecting the police theory that the killing of Pradhuman was the handiwork of Kumar.